What may look like weeds to the untrained eye are great alternatives to common vegetables to Kevin Prier, who over the course of a Sunday afternoon shared his passion for such plants with guests who showed up at his home for an Edible Landscaping and Foraging class. Prier, owner of Suburban Homecraft, teaches a variety of classes ranging from Introduction to Beekeeping to Canning Basics. The classes often are offered through the River Road or Springfield-based Willamalane park and recreation districts – with Sunday’s class sponsored by Willamalane even though it was at Prier’s River Road area home. “It is really gratifying and exciting to be able to share my enthusiasm and get other people really enthusiastic about growing things for themselves and trying new things,” Prier said. Prier said he often sees people from two demographics in his classes. Many, he said, are 30-somethings who want to feed their kids well and live a healthier lifestyle by eating fresh foods and staying away from preservatives and artificial colors. “If you’re pulling it out of the garden, it’s not going to get any fresher than that,” Prier said with a laugh. Many other attendees are people in their 60s or 70s who remember growing making their own food with their parents before the “big packaged-food phase,” as Prier puts it. One couple who showed up Sunday was Alan and Jan Hillyard, frequent gardeners who said they found Prier’s class very informative. “We’re interested in gardening like this because we want to do this same type of sustainable gardening so we can garden year-round,” Alan Hillyard said. 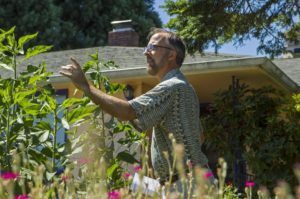 As he led the group around his yard, Prier highlighted both common perennial vegetables and their uses, such as rhubarb and kale, as well as lesser-known foraging plants that are edible. His favorite weed is lamb’s quarters, which Prier said can be a great substitute for spinach. 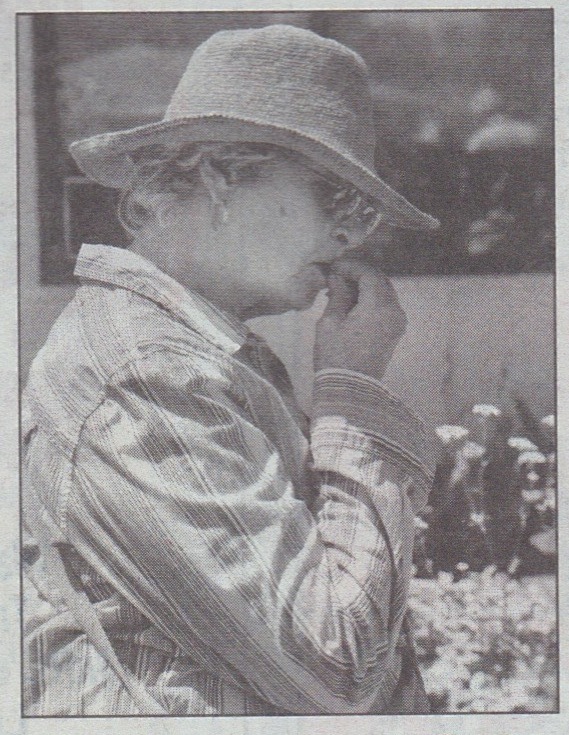 Prier said many people are hesitant when it comes to foraging, afraid of consuming something poisonous. But Prier says he’s found that many plants considered poisonous may cause symptoms like indigestion but are not likely to kill you. Others that are seriously poisonous, such as poison hemlock, can be easy to identify. Prier and wife Christina Steffy homeschool their two children, 12-year-old Jocelyn and 15-year-old Isaac, who help the family sustain their way of life. The children complete tasks such as clearing snails from the garden or canning tomatoes, and Prier said it’s a great way to bond as a family. “They certainly like the results,” Prier said of his children. “Part of the deal is if you want to eat it, you have to help prepare it. Rather than sell any extra food that they grow, the family gives it to friends or to organizations such as the Burrito Brigade, which helps feed the homeless. Prier said livingliving a sustainable lifestyle – by employing such strategies as foraging for “weeds” – is less expensive than buying organic food and healthier that buying processed food, and also offers a sense of accomplishment. Kevin Prier, of Eugene, teaches an Edible Landscaping and Foraging class from his home on Sunday afternoon. 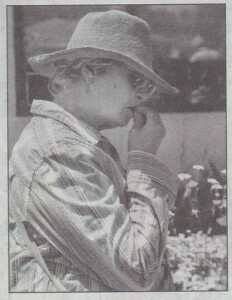 Diane Scott, of Springfield, tastes an edible plant. 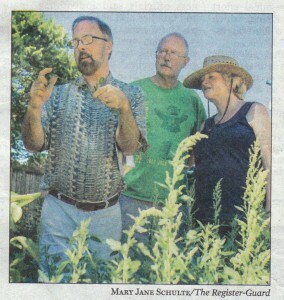 Kevin Prier (left) shows Alan and Jan Hillyard a plant from his garden while teaching his Edible Landscaping and Foraging class.